Please join the History on Film Club for popcorn and drinks today at 2:30 in the lecture hall for the film “Blood Diamond.” A story of survival set in West Africa and the exploitation of laborers who mine illegal Conflict Diamonds. Cheerleading tryouts will take place today, Wednesday and Thursday from 4:00-6:00pm in the gym. You must have a current VSHL sports physical to try out. See Coach Channing in the café if you have any questions. RamNation – do you remember how you felt on your first day as a freshman? Were you scared, nervous, did you feel lost? Let’s try to make the class of 2020 feel comfortable and welcome. If you are interested in becoming a 2016-17 Rambassador please pick up an application from Mrs. Dixon in room 404 or 409. Application deadline is today. Seniors – exemption forms will be available in Mrs. Henry’s office on Tuesday, May 31st. You must have earned an average of 80% in your class and not exceed five excused absences with zero unexcused absences. Also, 3 excused tardies to class constitutes as one absence. Exemption forms must be turned into Mrs. Henry by 3:00pm on Friday, June 3rd. Rising juniors and seniors – the Econ/Personal Finance course is now being offered free of charge over the summer. If you want to knock out this credit and get ahead, see your school counselor as soon as possible for more information. Registration forms are due to the Counseling Office by Wednesday, June 8th, first come, first serve. Please join the History on Film Club for popcorn and drinks on Tuesday, May 31st at 2:30 in the lecture hall for the film “Blood Diamond.” A story of survival set in West Africa and the exploitation of laborers who mine illegal Conflict Diamonds. Cheerleading tryouts will take place Tuesday, May 31st – Thursday, June 2nd from 4:00-6:00pm in the gym. You must have a current VSHL sports physical to try out. See Coach Channing in the café if you have any questions. Attention seniors – exemption forms will be available in Mrs. Henry’s office on Tuesday, May 31st. You must have earned an average of 80% in your class and not exceed five excused absences with zero unexcused absences. Also, 3 excused tardies to class constitutes as one absence. Exemption forms must be turned into Mrs. Henry by 3:00pm on Friday, June 3rd. Attention rising juniors and seniors – the Econ/Personal Finance course is now being offered free of charge over the summer. If you want to knock out this credit and get ahead, see your school counselor as soon as possible for more information. Registration forms are due to the Counseling Office by Wednesday, June 8th, first come, first serve. 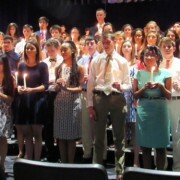 Lafayette recently inducted 58 new members in to the National Honor Society during a candlelight ceremony in the lecture hall. They joined the current membership of 77 seniors. 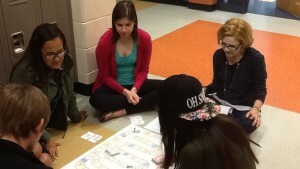 English teacher Judy Salzman was the guest teacher. Congratulations to the new NHS members! 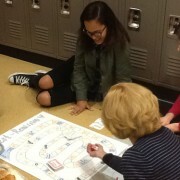 RamNation – do you remember how you felt on your first day as a freshman? Were you scared, nervous, did you feel lost? Let’s try to make the class of 2020 feel comfortable and welcome. If you are interested in becoming a 2016-17 Rambassador please pick up an application from Mrs. Dixon in room 404 or 409. Application deadline is Friday, May 27th. Attention seniors – exemption forms will be available in Mrs. Henry’s office on Tuesday, May 31st. You must have earned an average of 80% in your class and not exceed five excused absences with zero unexcused absences. Also, 3 excused tardies to class constitutes as one absence. Exemption forms must be turned into Mrs. Henry by 3:00pm on Friday, June 3rd. If you have any questions please see Mrs. Henry. Rising juniors and seniors – the Econ/Personal Finance course is now being offered free of charge over the summer. If you want to knock out this credit and get ahead, see your school counselor as soon as possible for more information. Registration forms are due to the Counseling Office by Wednesday, June 8th. First come, first served. RamNation – do you remember how you felt on your first day as a freshman? Were you scared, nervous, did you feel lost? Let’s try to make the class of 2020 feel comfortable and welcomed. If you are interested in becoming a 2016-17 Rambassador please pick up an application from Mrs. Dixon in room 404 or 409. Application deadline is Friday, May 27th. This past week the girls and boys outdoor track team won the VHSL Group 4A Conference 18 Championship. The girls scored a record high of 215 points. Outstanding performances were: Alexis Brender Brandis was 1st in the 100m hurdles. She was 1st in the long jump, triple jump and placed 2nd in the 300m hurdles. Selena Jones was 1st in the 300m hurdles. She was 2nd in the triple jump and placed 2nd in the 100m hurdles. Kenya Holiday was 1st in the 100m, 2nd in the 200m and 4th in the shot-put. Audrey Hurley was 1st in the 200m and 1st in the 400m. Brooke Crookeston was 1st in the 800m with a new school record. Peyton Blanding placed 1st in the pole vault and 3rd in the 100m hurdles. Serenity Chavez was 2nd in the 800m with a PR. Delaney Savedge placed 2nd in the mile. Kasiah Blake was 2nd in the 100m and she was 2nd in the long jump. Carley Seay placed 2nd in the pole vault. Victoria Rizk placed 3rd in the pole vault. Talisha Hairston placed 4th in the 300m hurdles. Khrystiana Hartfield was 4th in the 100m hurdles. Courtney Johnson, Summer Chambers, Camile Hairston, Kayla Poller, and Araya Morgado had a good conference meet. The boys scored 158 points. Outstanding performances were: Mike Tyler was 1st in the high jump and triple jump. He was 2nd in the long jump. He placed 3rd in the 110m hurdles. Konrad Steck was 1st in the 3200m run with a PR. Derrick Abson placed 1st in the long jump, second in the 400m dash with a PR. He was 3rd in the triple jump. In the pole vault, Damonte Dixon placed 1st with a PR. Jax Palmer was 3rd in the pole vault. Tyler Jump was 2nd in the discus throw with a PR. He also placed 2nd in the shot-put. Devon Underwood was 2nd in the 800m, and 3rd in the high jump. Rashawn Smith was 3rd in the 200m and 3rd in the 100m. Cameron Battle, Elijah Washington, Robert Walton, Jacob Radosta, Luke Martin, Keelan Hendricks and Hezekiah Grimsley, all had a good conference meet. Way to go Running Rams. 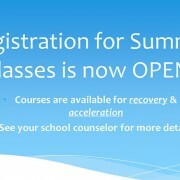 Summer school information is now available in the Counseling Office. Please see your counselor for more information. Cheerleading tryouts will take place Tuesday, March 31st – Thursday, June 2nd from 4:00-6:00pm in the gym. You must have a current VSHL sports physical to try out. See Coach Channing in the café if you have any questions. A.P. Psychology students playing the games they created on disorders, therapies, theories, etc. in psychology. Very detailed games that are informative and entertaining. 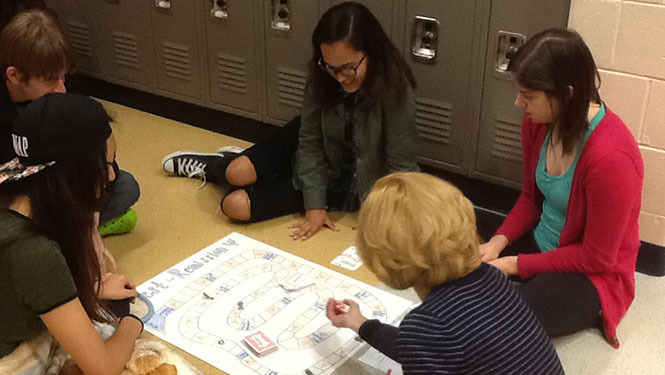 Seniors – if you are a member of the Lafayette Spanish Honor Society, you must get your tutoring hours to Mrs. Marzana in room 302 today. All underclassmen members have until the first week of June. RamNation – do you remember how you felt on your first day as a freshman? Were you scared, nervous, did you feel lost? Let’s try to make the class of 2020 feel comfortable and welcomed. If you are interested in becoming a 2016-17 Rambassador please pick up an application from Mrs. Dixon in room 404 or 409. Application deadline is Tuesday, May 24th.